The month of July zipped right by. I was traveling for half of it, and keeping up with the World Wide Web is always more of a challenge on the road. My trip to London was amazing. 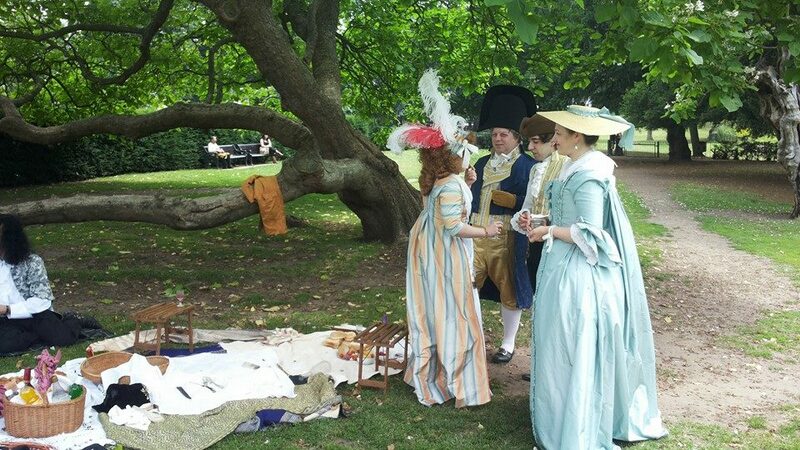 The week I spent at The School of Historical Dress was so special and I learned sooo much. You folks in the London area are so extremely lucky!! Working with Luca and Claire was incredibly inspiring, and learning from Jenny and the school’s collection just blew my mind. To commemorate, I finally got Seventeenth Century Women’s Dress Patterns 1. I will go back some day, for sure. The research I did at the British Library and the Victoria and Albert Museum also rocked my world. Who’d have ever thought that I would hold in my bare hands a 16th century book filled with hand-waterpainted embroidery designs?? It has become clear to me from this trip that the artifacts are as important to me as the information they contain. I was emotionally moved by the experience of handling them, and found myself treating them with reverence. An important insight as I pursue grad school options. And I also enjoyed a wonderful Georgian picnic at Chiswick House in London! I met friends new and old, many whom I’m sure I will see again. I wore my blue silk taffeta francais gown that I’ve been working on retrimming. When I got home I just had to shake things up (a reflection of my internal experience on my trip? ), with the result being a dramatically reorganized studio, so I’ll be back to my needlework tomorrow! I feel like I now have the confidence to take on a few of the projects that I’ve had in mind, but been reluctant to start. My paper at the Medieval and Renaissance Forum was very well received! What a relief! I got great feedback and lots of encouragement to keep going with my research as well as pursuing higher academic degrees. Grad school here I come! I was also invited to share my paper at another conference in October! What a great start to my career as a scholar. In future updates to my website I plan to include a link to some of my written work. In preparation for my big trip to London, I’ve had a couple of things on my mind. One is that I want to start preparing to raise my skill level as an embroiderer. I signed up for an online embroidery course with Mastered which looks like it will help me with breaking through some of my creative inhibitions. I also want to have a smashing good website before I go. Last week I participated in a webinar on website development with Mastered and Mr. X and was selected for one of the three case-studies. I got great feedback there too and you can see I took action on some of the suggestions by the changes I’ve made since the last time you were here. I have more in-store! More good news! I have the opportunity to attend a week-long course at The School of Historical Dress in London, England! I will be working with seventeen other students to reconstruct accessories for an 18th century lady. Yes, there will be embroidery involved, and I can’t wait. The School houses Janet Arnold’s collection and I am hopeful that it will come into play during the week. If you’d like to learn more about the school and their wonderful teaching staff (including one of my heros, Jenny Tiramani), here’s a link to their website. And to help me get to London this summer, please continue to check on my items for sale on Etsy!